One of my first Inside the Bloggers Studio interviewees was Sharell Cook of ‘Diary of a White Indian Housewife’. Since then, I’ve been lucky enough to meet Sharell and her husband in Mumbai and even more lucky to count them both as friends. It’s as a friend that I write this post full of pride for Sharell, because she is finally a published author. ‘Henna for the Broken-Hearted’ hit the shelves in Australia a week or so ago, and it’s great to see Sharell’s straightforwardly elegant prose gracing the pages of a real live book, not just on the computer screen. And while I’ll refer to her in the first person throughout this review (we are on first name terms, after all), I won’t be biased. Well, not too biased. I hope. The book is closely tied to the blog Sharell has written for the past few years. ‘Henna for the Broken-Hearted’ tells her story of making an unexpected transition from Australia to India, finding love and a chief purpose in life – writing – along the way. It all sounds very ‘Eat Pray Love’, especially with a title like ‘Henna for the Broken-Hearted’, but this book is much better written, more informative and more resonant than Elizabeth Gilbert’s me-me-me-memoir. The title even makes sense once you read the introduction, linking the slow reveal of henna designs as they are painted to the unfurling of meaning in one’s own life. The book follows Sharell through heartbreak in Australia, volunteer work in Kolkata, falling in love with an Indian man and – after some eye-opening experiences in the beach town of Varkala and Himalayan village Manali – eventually settling in Mumbai as an Indian housewife. If you’ve been following Sharell’s blog for a long time, a lot of this will sound quite familiar, but the facts are presented in ‘Henna for the Broken-Hearted’ in a longer and more cohesive form. Rather than coming across as a series of connected vignettes, the book actually feels a book, as in a single story that we follow from the first page to the last. However, an interesting sense I get from the book is that rather than having a traditional ‘ending’, ‘Henna for the Broken-Hearted’ gives a clear sense that Sharell’s life went on beyond the confines of its pages. We’re dropped into Sharell’s life for a few years, privy to a period of incredible upheaval, but we know that the end is not actually The End. Sharell makes no claim to understand everything about India, married life, or even about herself, and we can feel that the learning continues after the last page. I, for one, will be clamouring for a sequel. What ‘Henna for the Broken-Hearted’ really offers, though, is an honest new voice. I’ve always found Sharell to write on just about any subject with fundamental truth and honesty, but without compromising on elegance. I think that’s what sets the book apart from most transitional stories. There are no attempts to trick the reader by writing floridly around a point; instead, Sharell tells it exactly like it happened, warts and all, and she does so in a way that illuminates the deeper truths behind her experiences – truths many of us will be able to relate to. In her honesty, Sharell transcends simply narrating her own experience and speaks to all of us. Probably the strongest section of the book is when Sharell is slowly getting to grips with Kolkata and falling in love with her husband-to-be. Their courtship is incredibly sweet and romantic, a real-life fairytale, but tempered with the reality of Sharell’s freshly broken heart and the more immediate challenge of dealing with daily life in India. She gives a good sense of what it feels like to drop yourself in such a foreign environment, and what the adaptation process is like. It’s slow, and there’s no single ‘eureka’ moment of understanding. If you put your mind to it, though, there are many small understandings along the way, each adding to a slowly growing knowledge and understanding of one’s surroundings. This is what happens to Sharell the longer she spends in India, and it’s what happened to me too. On the other hand, I do have a criticism: the book is too short. Yes, I know it sounds like I’m pandering, but there were often moments where I wanted more detail about a particular event, like some of her experiences in Varkala and Manali. Still, the book is about a transformative process over a number of years, not so much the small details. Cramming those years into 300 pages without losing all sense of perspective is an admirable feat, and anyway, there are plenty of small details to flesh out the story and make it more real. I recommend ‘Henna for the Broken-Hearted’. It certainly isn’t for everyone, particularly folks who have no interest in India or in alternative healing therapies (which also feature at certain points of the book). However, those with an interest in transitional stories, cross-cultural experiences and the essence of true love – and figuring what that means – will find it fascinating. Congratulations, Sharell. Here’s to many more! Reading Sharell’s book was the same as having an opportunity to secretly watch the life of someone while reading their thoughts. She takes you on an amazing journey through India and herself, without holding anything back. Most people would have edited out the ‘bad parts’ version, but not Sharell. She lets you see exactly what she was thinking at that moment, exactly what her reactions to a situation are. You feel validated by her feelings and inspired by her experiences. For once, an honest book, written by a sincere person really living the “India” experience. I highly recommend this book! It is necessary to explain the significance of the title and its biblical allusion. In the Song of Solomon henna is the symbol of divine forgiveness and absolution in the sense of ceremonial purification. Apart from its usual meaning of skin and hair dye, and its use as hand and foot decoration in bridal mehndi, it is also used as an emblem of love, human sexuality, excitement of amorous feeling and rejuvenation of the broken and crestfallen heart. 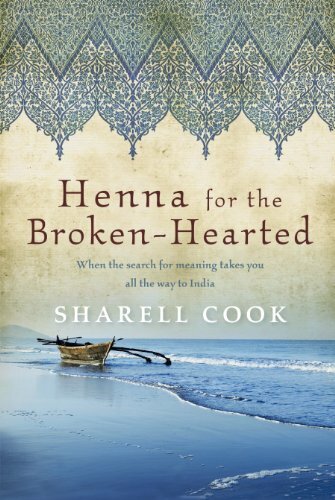 Hence the significance of the title of Sharell Cook’s celebrated book ‘Henna for the Broken-Hearted’ (Pan Macmillan). You are too gassed up sir. Read the book. That which you actually learn, from any given pair of circumstances, determines whether we become increasingly powerless or maybe more powerful. Our work is the presentation of our own capabilities.